Super Thundering 888 Classic Slot Guide & Review - Casino Answers! 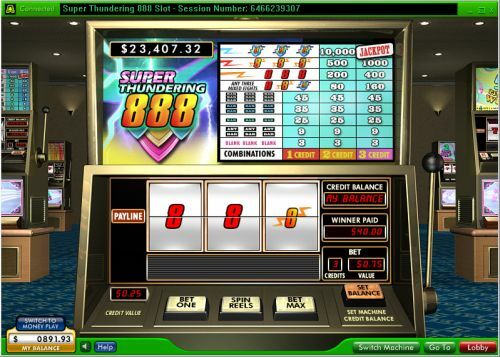 Super Thundering 888 is a 3-reel, 1-line classic slot machine developed by Random Logic, featuring a progressive jackpot. You can play the Super Thundering 888 progressive jackpot slot at Bovada. The coin value on the Super Thundering 888 slot machine is fixed at $0.25 per spin. You can bet 1-3 coins. Super Thundering 888 is a quarter slot, so you can bet anywhere from a quarter up to $0.75 on a spin. Casino Answers recommends playing the maximum 3-coin bet at all times to be eligible for the progressive jackpot. To play the Super Thundering 888 classic slot machine, select your bet with “Bet One” and press the “Spin Reels” button. You can bet 3 coins on a spin by pressing the “Bet Max” button. You can win the Super Thundering 888 progressive jackpot by hitting 3 Super Thundering 8 symbols on a maximum bet spin. The Super Thundering 888 progressive jackpot is currently at $23,408 When betting 2 coins, you can win 10,000 coins with the same winning combination. You can win the Super Thundering 888 progressive jackpot by playing it at Bovada! There are 9 winning combinations on the Super Thundering 888 classic slot machine. The complete payout schedule is as follows (1/2/3 coin payouts in parenthesis): 3 blanks (3/3/3), 3 of any Bar symbols (9/9/9), 3 Single Bar symbols (25/25/25), 3 Double Bar symbols (35/35/35), 3 Triple Bar symbols (45/45/45), any 3 mixed 8 symbols (-/80/160), 3 Regular 8 symbols (-/200/400), 3 Thundering 8 symbols (-/500/1000) and 3 Super Thundering 8 symbols (-/10,000/jackpot). Super Thundering 888 offers a good-sized progressive jackpot at a very cheap cost per spin. There are also some good payouts no matter what your bet is, although we do not recommend playing anything other than the maximum bet on Super Thundering 888. You can play the Super Thundering 888 classic slot game and play for the progressive jackpot when you sign up at Bovada! Can players from the United States play for the Super Thundering 888 progressive jackpot? No, American players cannot play the Super Thundering 888 online slot game for real money. There is a great selection of USA-friendly progressive jackpots that can be played at Bovada. How do I win the Super Thundering 888 progressive jackpot? You can win the Super Thundering 888 progressive jackpot by lining up 3 Super Thundering Eight symbols on the center payline. In order to be eligible for the jackpot, you must play the maximum bet.